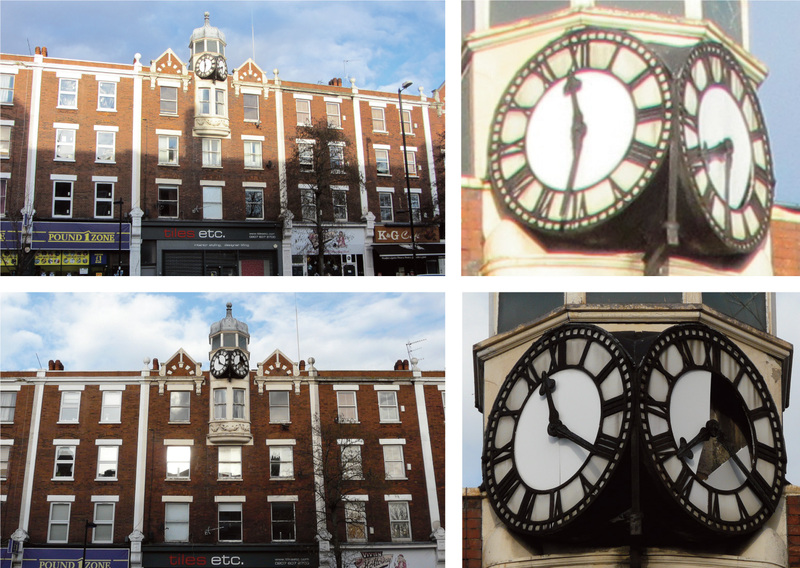 Directly above No.296 Holloway Road, just north of the tube station, there are two angled clock faces under a lovely old eight-sided windowed cupola. 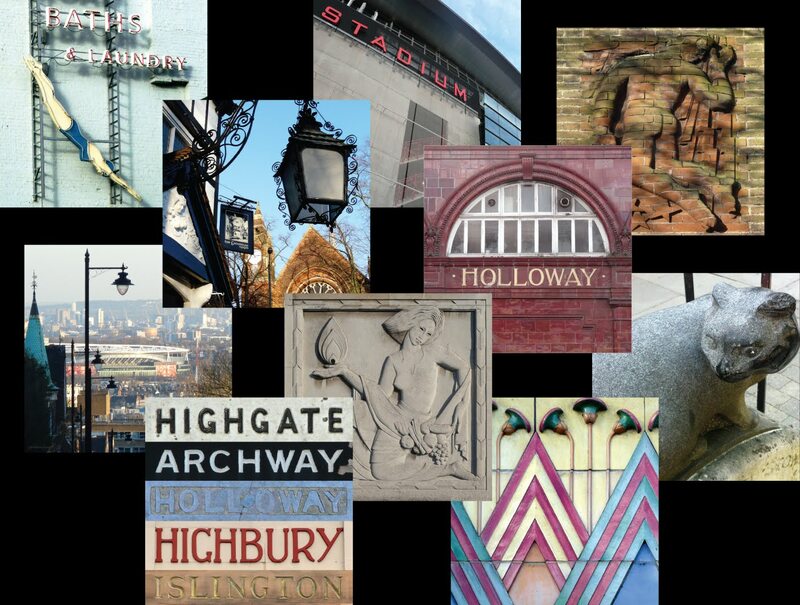 It harks back to a time in the 1890s when this area of Holloway was affectionately known as the Oxford Street of the North and lined mostly with outfitters' shops. For over a hundred years these two clock faces remained intact, albeit telling the wrong times, but over the past few years both have suddenly deteriorated. As you can see from the pics above, chunks started falling out of the right hand one sometime after March 2013. But the speed of this deterioration confuses me – if you assess the earlier pics you'll see that there were no cracks on that face, so how did the breakage occur? Note also how the left hand clock was still completely intact 18 months ago. This week I noticed with sadness that the pair are now in a terrible state with practically all of the central white areas on both clocks empty apart from one little triangular piece hanging on in there. Some people tell me they think this is just general wear and tear over time. Perhaps the seal around the circles had reached the end of its lifespan? But, to me, it seems odd to me that these sections would break and fall off in such a short space of time. 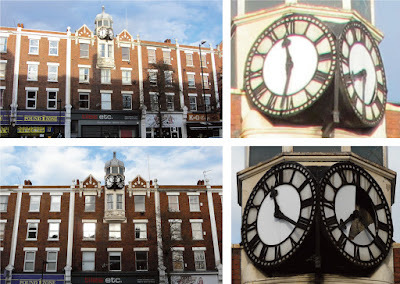 I wonder if this damage could have been caused on purpose, either by people who have got up inside the cupola and damaged the clock faces by hand, or they have been used as some kind of target practice from a vantage point somewhere across the road, in which case, it's vandalism. 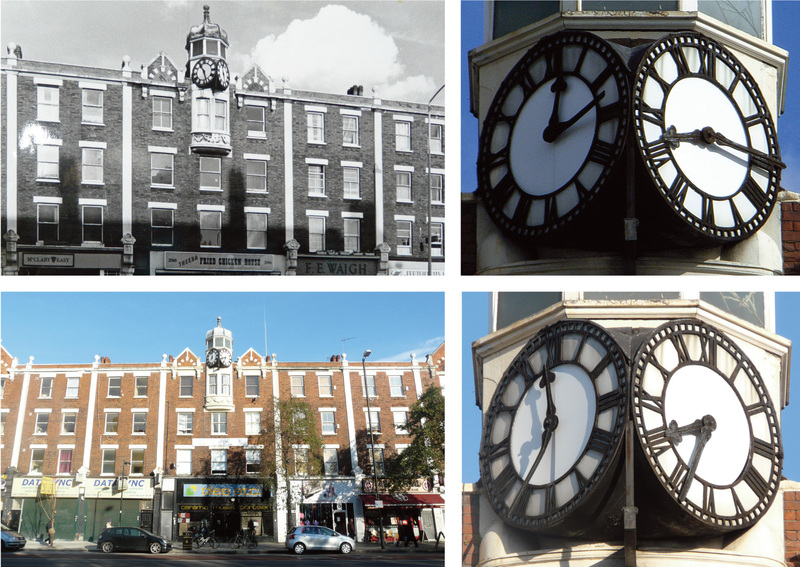 Let's hope the clocks can be restored; it can't be that difficult. 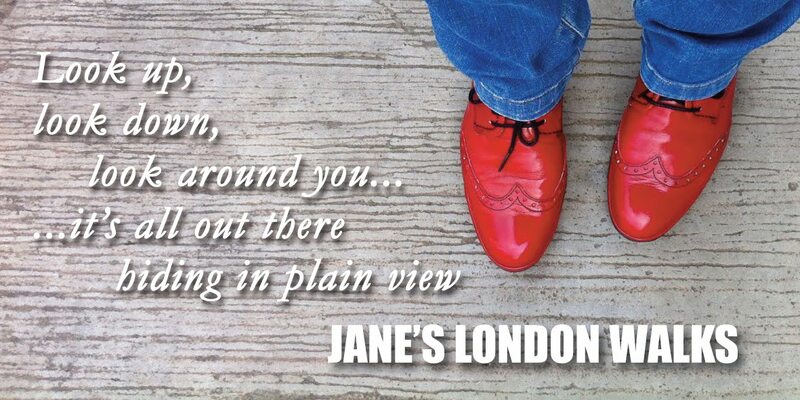 Read more about it here in the Islington Tribune. The title of this post refers back to a post I wrote last year about children's playground games.